In order to reach its sustainability targets, Europe needs to embrace every option to generate renewable energy. Solar panels installed on roofs provide a good alternative but in many countries such energy production is not enough to cover energy demand. Innovation: A consortium initiated by EARTO member TNO developed SolaRoad, a road with integrated solar panels which can convert solar energy into renewable electricity. As safety must be ensured under all weather conditions, researchers developed a translucent, non-slippery and easy to clean road coating able to resist enormous pressure. The first pilot is being performed on a cycle path, but the SolaRoad has been tested to handle the pressure of a fully loaded fire truck. Impact Expected: The first generation of SolaRoad can create 75 to 80kWh electricity per square metre of road surface per year under Dutch climate conditions. Generation two is expected for 2017 and will be able to generate over 100kWh annually. 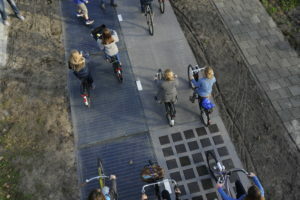 This means that a 10m length of SolaRoad will generate enough renewable energy for an average Dutch household. By 2017, SolaRoad is expected to be applicable to bus lanes, streets in residential areas and parking places. TNO, an independent Dutch RTO, has some 3000 professionals who put their knowledge and experience to work in creating smart solutions to complex issues.